I felt my first earthquake when I was about 14 or 15, my family and I were on holiday in Los Angeles. We were in the hotel room and it was probably sometime in the morning when the floor moved. Then a recorded voice advised us from outside the corridor not to worry, that it was an earthquake. Or something to that extent. My sister and I were less worried than excited – our first earthquake! Of course we were all thankful that it was just a very minor one. Then we went about our day. Earthquakes are a rarity in Singapore, although we are close to the earthquake-prone area of Indonesia, and not too far from where the Indian Ocean tsunami happened. I don’t recall ever feeling an earthquake when living in Singapore. So to move from Singapore to the San Francisco Bay Area a few years ago was, well, interesting. When we bought our house, the contract had all these statements about being close to the Hayward Fault, and various other things. And so I worry quite a bit about the possibility of earthquakes although I have only felt two earthquakes since we’ve lived here, and they were minor ones. But reading this book, and realizing that scientists at the US Geological Survey predict a high likelihood of a big one happening in the area before 2032, gives me the shivers. I realize that 1906 was a long time ago, that things have changed tremendously in terms of building design and what not, but I can’t help but worry! Especially since the 6.0 earthquake that occurred in South Napa just in August, which, while fortunately not too many were injured (and sadly, one person died after chimney bricks fell on him), did quite a bit of damage. 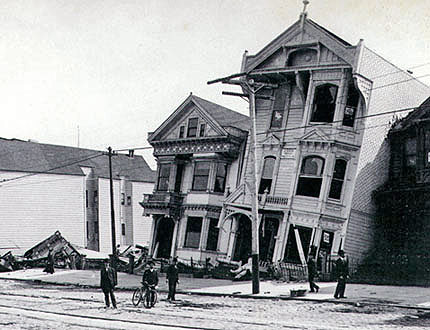 Plus look what happened in 1989, during the disastrous Loma Prieta earthquake. Is the Bay Area prepared for the next big one? Am I prepared if something does happen? I really don’t know. Anyway, back to Winchester, who I reckon is the type of person who enjoys taking long meandering walks just to see where things go, because that’s how his book reads. 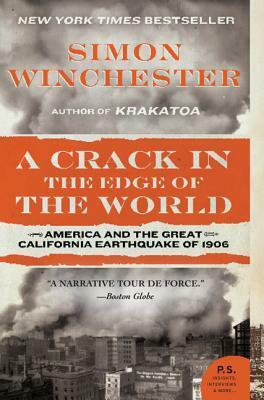 Winchester begins by tempting the reader with some snippets of information on the earthquake, some depictions of it from first-hand accounts, and some longing and loving depictions of the city and its surrounds, from his perch high above on Mount Diablo. I can understand all that geological and geographical facts that he pounds away at. It is an earthquake book, that was to be expected. To read of a meteor crater in Winslow, Arizona, though and various small towns in Missouri and California, which have seismologists all excited, ok fair enough, but Winchester does take us on a rather long meandering route through time and space before we eventually get to 1906 San Francisco. He has after all driven from the east coast of the US to the west, and I guess that means he has a lot of time to think about his project, his journey and more. So to finally return to San Francisco in the 1900s is a bit of a relief. But Winchester isn’t ready to take us to the earthquake, not quite yet. First we learn about the relative youth of America in those days, the treaties signed like the Louisiana Purchase, buying 600,000 acres of Alaska from Russia, then the treaty signed with Mexico for western lands. And of course one cannot talk about San Francisco history without touching on gold. Some Chinese still refer to this area as “旧金山” (pronounced ‘jiujinshan’) or literally “old gold mountain”. But wait! In Chapter Seven, Winchester heads back to contemporary times, this time bringing the reader to central California and a little farming town called Parkfield, a “much-measured place” full of scientific equipment, devices monitoring monitoring monitoring seismic activity. And there are discussions about plates and a variety of other things that may interest you more than me. Aha, Chapter Eight takes us back in time again, with more of the story of San Francisco! Ok so in case you haven’t guessed yet, I am more of a history buff than a geography one. I love all these little details about life back then – how prices of goods rocketed after the gold poured in (nearly a million dollars in the first eight weeks), how people abandoned their jobs to go dig up some gold (more than 200 sailing vessels lay offshore in July 1849, sailors all after the shiny things. By the end of the year, this number was 600!). People lived in flimsy tents, and it was filthy and just downright dirty and gross. And corrupted. This was the mid-1800s. And he throws in all these tidbits, like how the San Francisco patois, like the use of ‘crib’ to mean ‘home’, ‘crimp’, ‘shanghai men’, and even ‘hoodlum’. And far more fascinating (at least to me) details about life in San Francisco, in the west in the 1800s. Oh I bathed in this chapter, I really did. Because Winchester, when he’s good, he’s really really good. And TADA, in Chapter Nine, we get to April 17, 1906! FINALLY. Winchester digs up accounts from various people, policemen, hotel guests, ship captains, even a very young Ansel Adam and his Chinese cook. He makes the simple point that clocks stopped, because they ran on pendulums. And this one detail stuns me. I understand the telegraph wires going down, the fires and all that. But to think that they weren’t able to tell the time because their clocks stopped blew me away. Yes it was a long time ago. And the destruction. Relentless. Complete. Devastating. 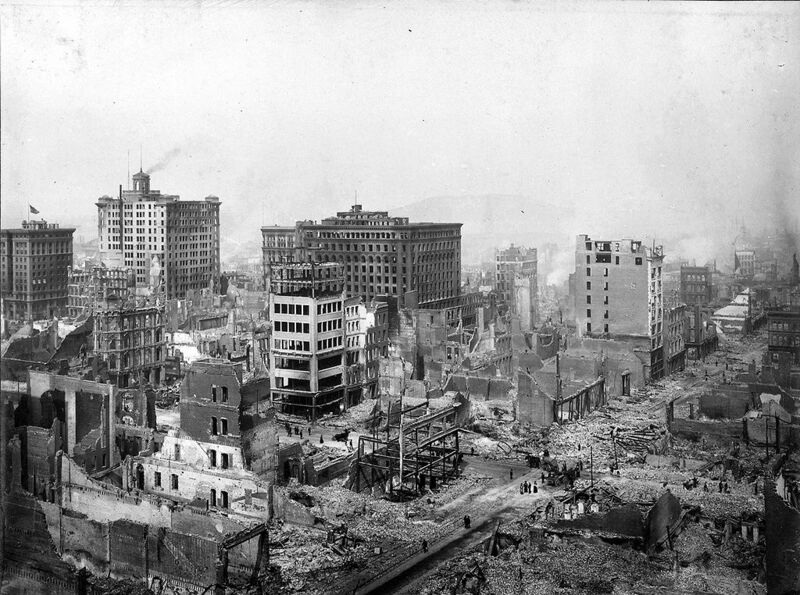 – The federal government estimated that only 3 – 10% of the damage done to the city was directly due to the earthquake. – It burned across 2,600 acres, destroyed 490 city blocks, 28,188 buildings. – They burned for three days. Dynamite had to be used to create firebreaks. The water supply pipes had mostly fractured. Eventually the rain began. Ok so I’ve complained quite a bit here about this book and how long it took to get to the actual event. But I understand it, I understand Winchester’s need to set the stage, to get the reader to understand what things were like at that time, to lay a foundation for the reader about plate tectonics and the earth’s movements and stuff. He wanted to cover all his bases. It’s just sometimes that these places that he visits, the connections he makes between issues is a little bit odd, for instance, he mentions a little town in Ohio, which is the hometown of Neil Armstrong and somehow that takes us all the way to the Gaia theory. He also brings in various characters, hints at their lives and what they were doing during the earthquake but then he drops them and seems to forget that he ever talked about them. I was alternately bored and fascinated by this book. The far-too-detailed stuff about geography made me skim the pages, whereas I loved those details about life in the 1800s and 1900s, how things were so different. Simon Winchester is one of those people with such devotion and enthusiasm about a subject that he is willing to drive from San Francisco to Anchorage, Alaska, just to see a pipeline. I was wondering, as I FINALLY finished this book, is this Winchester’s style? He has written quite a few popular books on a variety of subjects, and for a while I was quite convinced I had read one of his books but I realize now that I haven’t, that this was my first Winchester. Did I simply pick the wrong one to start with? Is there another Winchester book that is more readable? It did however make me want to read more about the anti-Chinese sentiment that wafted around California at that time. Many years ago, I read Iris Chang’s The Chinese in America. And it might be a good time to revisit that. 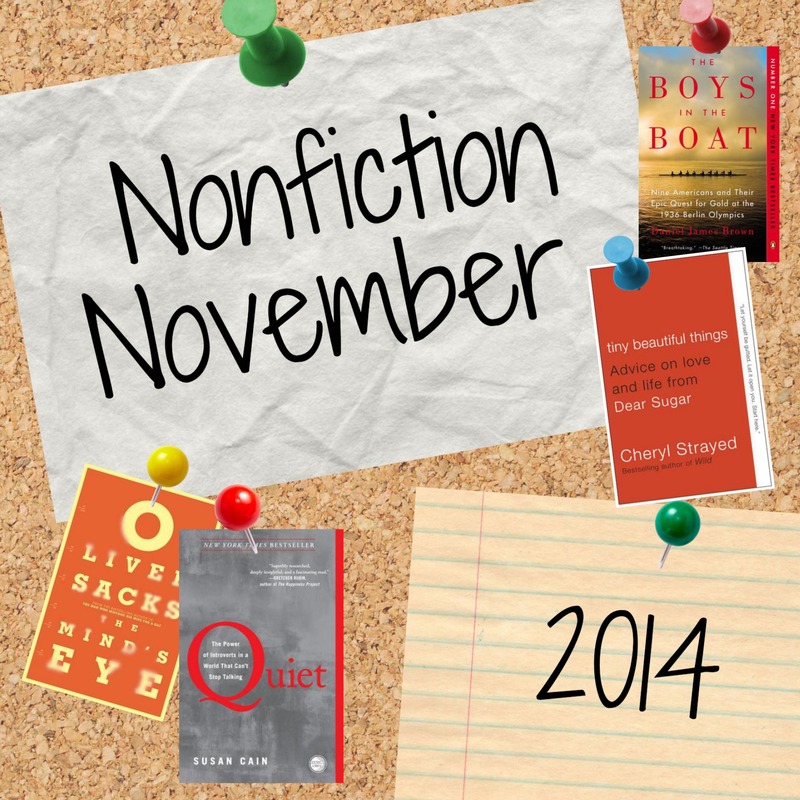 I read this book for Nonfiction November 2014, an event hosted by Lost in Books, Sophisticated Dorkiness, Regular Rumination, and Doing Dewey.